On Tuesday October 24, 2017 around 4 o’clock I went to my carom table in my home and started to practice and hit a few balls. My friend and I for the last year or so have been saying to each other that whomever runs ten first must call the other. Weeks went buy and so did months. Each time I’d go to the table to play I’d think about my highest run in the past. It was in the early 70’s that I that glorious run of 12. One thing I didn‘t want to happen was that I miscue on my 10th point. I studied the shot again and again. Then, when I was finally ready, I pulled the trigger and watched my cue ball go 3 rails to make my 10th point. Even though it was on my own table in my home, and I was all by myself, I jumped up and had a big smile on my face. I felt as if there were people applauding me and yelling that’s the way to go Professor-Q-Ball. I couldn’t wait to make the call. Then I realized I was alone and the next thought that came into my head was wait a minute I am still at the table. Maybe I can break my all time record of 12. As I made the 11TH and 12th points my heart was pounding and I was praying please let me make the next shot to break my record. I had two shots to pick from. One was very difficult and the other was easier, but had a possible kiss. As I went down to shoot, my mind was telling me not to take the easy shot. I always heard the better players say, If you think there may be a kiss, avoid the shot. So instead I chose to shoot the harder one… and I made it! And once again the crowd went wild. (Only to realize again it was In my mind). 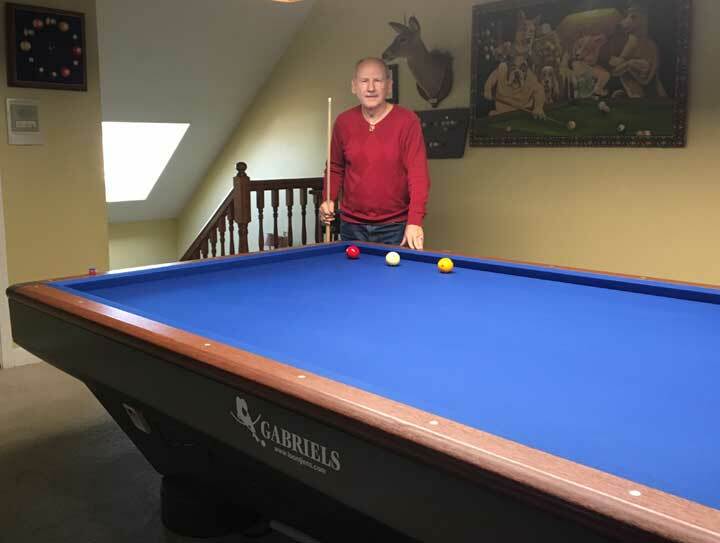 Finally… after all these years, I had broken my record for a high run on a my Gabriels Carom table. The 14th shot was not an easy one.. so that is where it ended. But it was truly a great feeling being up there on cloud 13.